KIT power amplifier 1.8-54 MHz 1200W for LDMOS BLF188XR with protection units includes. Amplifier board PA1200W 1.8-54 MHz for BLF188XR (without transistor). Input protection unit with ATT 7dB. PEP/AVG LCD power and SWR meter 1200W. Intelligent DC switch with protection triggers. BIAS voltage regulator is not included (temporarily). You have to add LDMOS transistor BLF188XR, LPF, copper heat spreader plate and aluminum heatsink to complete design. 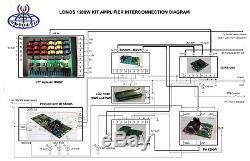 The item "KIT power amplifier 1.8-54 MHz 1200W for LDMOS BLF188XR with protection unit" is in sale since Thursday, May 25, 2017. This item is in the category "Consumer Electronics\Radio Communication\Ham, Amateur Radio\Ham Radio Amplifiers". The seller is "v_phil" and is located in Voronezh.